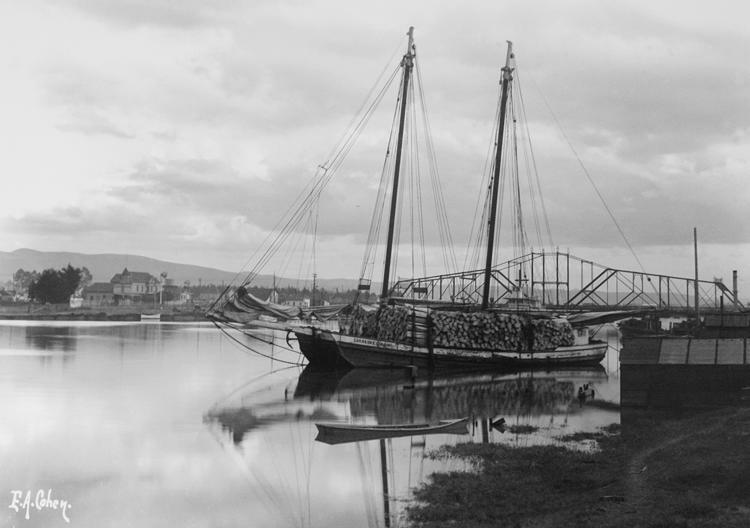 The original Park Streeet Bridge serves as backdrop for the scow schooner Caroline Dixon. Railroad baron A. A. Cohen's son Edgar took this photograph on December 15, 1905. According Edgar's notes, the schooner was delivering wood to a match-stick factory. The Park Street Bridge was the first of three that the federal goverment built over what would become the Oakland Estuary. The Park Street Bridge opened in 1892, and had a 10-year wait until the estuary opened. The Park Street, Fruitvale Avenue and High Street bridges would span the estuary, which finallly debuted in 1902. The first Park Street Bridge was a swing bridge.. When vessels began plying the estuary this bridge swung open and closed to let them pass. "Riding the bridge" as the boats chugged by became a favorite local pasttime. Thomas Rigging Company dismantled the Park Street Bridge, and spectatros looked on as the Harbor Barge and Tug Company towed the remnants away on Feb. 20, 1934. The present-day bascule bridge opened the following year on Oct. 5; to mark the occasion an Oakland man married an Alameda woman at center spen.